McALLEN – It was only a matter of time for Gabrielle Fonseca. Coming out of high school in 2016, the former All-District pick from PSJA High signed with McLennan Community College in Waco and played there for one year. The right-handed infielder batted .293 in 2017 was nearly perfect in the field establishing herself as a bonafide college player. 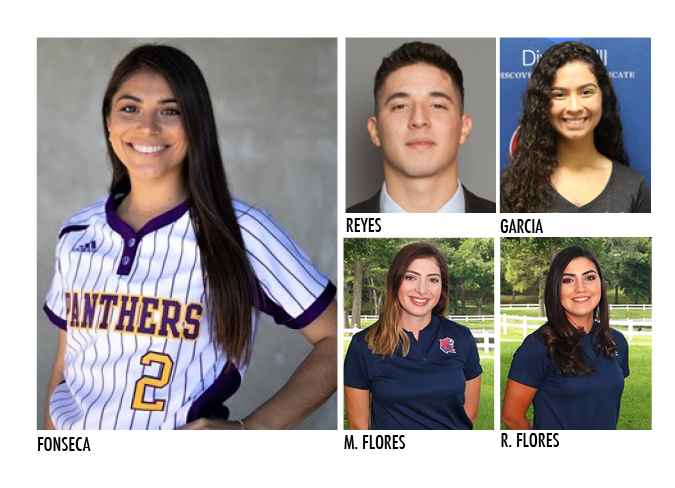 Fonseca caught the attention of Prairie View A&M University, a Division I school near Houston, and signed with the Panthers after her freshman year. Then after an adjustment period at PVAMU, the 5-foot-7 Fonseca caught fire late in the season and ended 2018 hitting .271 helping the team to a SWAC Conference Championship. This year, Fonseca is at it again. The junior’s average from the plate has shot up 50 points to .321, and she has doubled her RBI count to 16, has belted out 17 hits and scored 11 runs yet still has 17 games and the conference tournament to play. After putting the time in, getting better was just matter of clearing her head and focusing, thanks to her father. Fonseca also changed positions moving to shortstop after playing second. She hadn’t played short since high school, but she said: “I have fallen in love with the position all over again.” The right-hander has a .919 fielding average converting 57 of 62 chances with five errors. Prairie View is 18-9 overall and 6-1 in conference through last weekend. Fonseca said the team is looking forward to defending their crown. Ediberto Reyes, a freshman at the University of New Mexico, is making a name for himself at the Division I school in Albuquerque. The 5-foot-11 Reyes has seen action in 14 of the Lobos’ 26 games and is batting .341 with 14 hits, 11 RBIs and six runs scored through last Saturday. The righty also has five doubles and five walks to go with eight strikeouts from 41 at bats. In the field, the third baseman is nearly perfect for the Lobos. Reyes has made good on 43 of 44 chances posting just one error for a .997 fielding percentage. In a recent two-game series against Big 12 power Oklahoma, Reyes went 3-for-7 with a double and three RBIs. Also, he converted all 12 chances in the field. UNM is in the Mountain West Conference with UNLV, Air Force, Colorado State and others. Jennifer Garcia was the vanguard of Donna High tennis for three years. She won multiple tournaments and advanced to regionals where, as a senior in 2018, lost in the second-round regional quarterfinal. Now, Garcia, a freshman, is part of big group of underclassmen at Kerrville’s Schreiner University that’s leading the tennis team. Garcia has posted a 7-5 singles record and a 7-6 mark in doubles play this spring for the Division III Mountaineers. In doubles, she’s often been paired with Mission Veterans’ Kate De Los Santos. Garcia has played in a total of 14 singles and 14 double matches with a few were left unfinished. Overall, the Mountaineers are 7-7 on the season with four more opponents still to play. In 2018, they were 10-10. Mariana and Raquel Flores are making a powerful one-two punch for Division II Rogers State in Oklahoma. Both from Sharyland High, Mariana is a junior, and little sister Raquel is a freshman. Although a few years apart, both are well-established golfers who cut their teeth at Sharyland and in the junior golf circuit in South Texas. Both made multiple appearances at the UIL regional and state tournaments. Now playing at the collegiate level, both have experienced a variety of success. The 5-foot-7 Mariana played in 10 of Rogers’ 11 tournaments last season. This spring she’s played in five straight tourneys placing as high as tied for ninth at the Hillcat Classic on March 18-19. Meanwhile, the 5-foot-5 Raquel has also played in five straight and has two top 20 finishes – tied at ninth with her sister at the Hillcat and 15th at the St. Edward’s Invitational on Feb. 18-19. Another Flores sister, Paulina, is set to join them next year at Rogers. Rogers is in the Heartland Conference with schools such as St. Edwards and St. Mary’s.